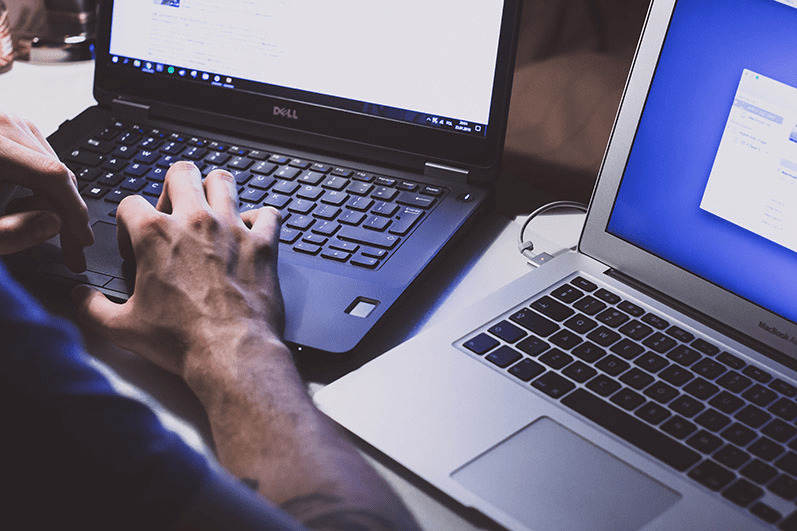 With Windows 7 hitting end-of-life (EOL) in January 2020, a fresh group of users will be upgrading to Windows 10 soon. There are a few key tips and tricks to know to get the most out of the new OS. 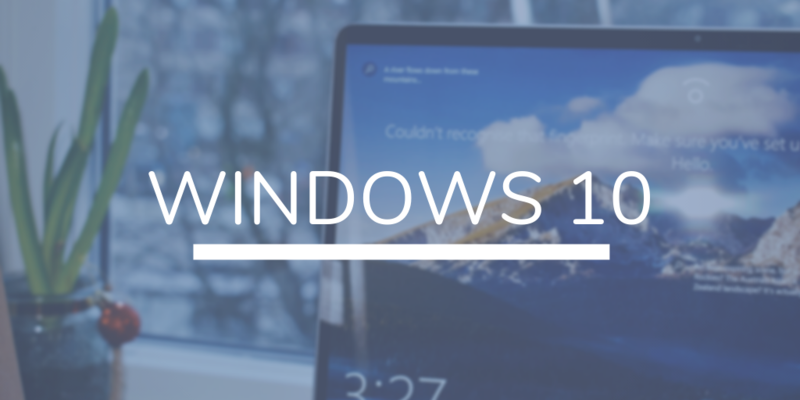 Microsoft updates Windows 10 a few times throughout the year with new features, and the April 2019 update is no exception. Check to make sure your system is up to date, and check out these features we love! Sign up for our webinar on April 24th to watch Windows 10 Tips and Tricks! 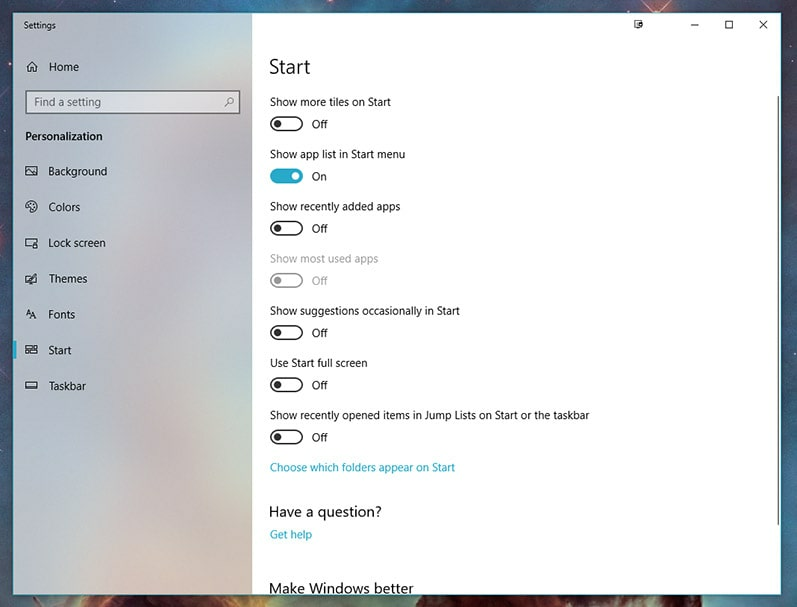 The first thing you’ll probably notice in Windows 10 is the colorful and vibrant Start menu. What once was a button on the bottom of your screen has grown to become a full-screen experience with live “tiles” that show images and even advertisements. If you love the new Start menu, great! You can head to Start > Settings > Colors, and customize the look of your new tiled environment, or head to the “Start” section and customize which apps appear in your grid. If you’re more akin to the old Start menu, simply head in to Start > Settings > Start, and turn off every button, except “Show app list in Start menu.” This will bring back the more familiar menu we’ve become accustomed to. 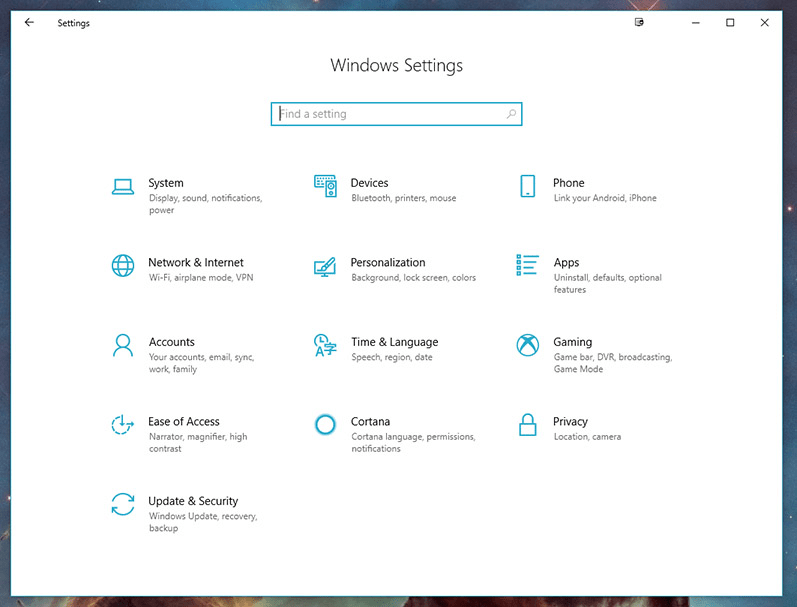 Customization of the Start menu in Windows 10 feels pretty much limitless. Whichever configuration you prefer, be sure to head to “Choose which folders appear on Start” in the settings menu. You can personalize which folders you have easy access to, providing quick access to your most-used folders. The search feature in Windows 10 is absolutely the most useful tool on the entire OS. No longer just meant to help you find a misplaced file, the search is integrated into systems menus as well. Simply start typing from the taskbar, and Windows will get you what you need. This means no more digging through five sub-menus just to figure out how to change your account picture. Even in system folders like Settings, you’ll be immediately greeted with a search bar. Type in what you’re looking for, and get instant results. Windows is pretty good at guessing what you’re searching for. For example, type in “desktop” and you’ll be given options about your desktop theme, remote desktop, and color personalization. Of course, the usual Windows Explorer search is also still around, ensuring that you can find that misplaced file from within the Documents folder as well. NOTE: With the upcoming April 2019 update, Microsoft’s virtual assistant, Cortana, will be separated from search. As of this post, searching from the taskbar beside the Start menu will bring up Cortana, asking if she can help with anything. You can simply ignore this feature, type what you need, and bypass the unnecessary assistant for now! We’re always being interrupted from our work. Notifications pop up at random intervals to pull our attention away from what we really need to be doing. Focus Assist is here to keep us on track. 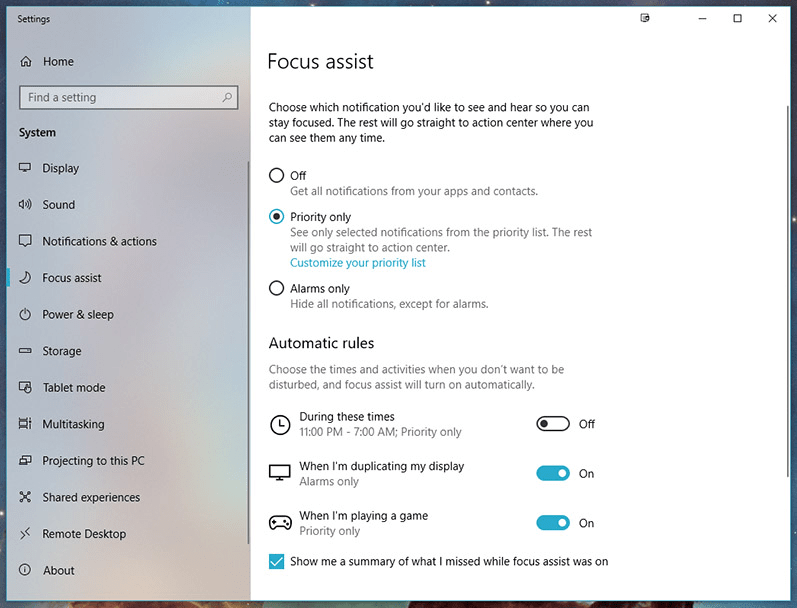 Focus Assist can be found under Settings. The no-interruption software can be configured to turn on automatically during certain hours, or when you’re duplicating your display, helping prevent embarrassing notifications during your important presentation. Some contacts will need to get through no matter what you’re focusing on. We’ve talked about the importance of configuring VIPs on your phone, and you can do something similar for your PC with Focus Assist. Under Focus Assist settings, we recommend selecting “Priority Only.” Beneath this option, you’ll see “Customize your priority list,” where you can select the important people and even applications you want to receive immediate alerts from. Everything not on this list will be pushed aside until you’re ready to turn your focus to distractions. Your action center will show you a summary of what you missed while Focus Assist was enabled whenever you’re ready to let your mind wander. Keep those distractions under control! We’ve chosen our three favorites, but there are so many new features to explore in Windows 10, especially for those acquainted with older version of Microsoft’s OS. Here are some other features to check out. Cloud Clipboard – Seamlessly copy and paste text, links, and pictures across multiple devices. Simply login to any Windows 10 machine, and your cloud clipboard will follow you anywhere! Windows Defender Security Center – Windows Defender provides great anti-virus protection at no cost, and the security center gives you complete control and visibility of your machine’s health. One screen allows you to find out if any actions are needed regarding firewall, account, or device security. Dark Mode – Do you work late at night or early in the morning? The bright monitor you’re staring at can cause headaches and eye strain. Under Settings > Color, you can select “dark” as the default app mode. This will allow most applications to use black and gray hues where white was originally. A much-appreciated feature for us morning birds! The transition to Windows 10 can be daunting, but the upgrades are absolutely worth the learning curve! If you’re interested in learning more and getting some advice from the pros, register for our webinar, “Windows 10: Easy Tips for a Smooth Transition."